I thoroughly enjoyed the DVD and find it very helpful in bolstering my confidence and knowledge base for doing commercial inspections. It was very well done and I enjoyed the humor interjects as well. and a high degree of skill. Although manuals, seminars, courses and experience in residential inspections or commercial construction are all useful when tackling commercial properties, the truth is most professionals find the process to be much more daunting than they expected. Even?experienced professionals can find themselves at a loss when faced with a 40,000 square foot building that needs to be dissected, inspected and conquered. Questions arise which were not addressed in the manual, and previously unheard of problems have a nasty habit of appearing. The process would be much simpler if only a trained professional were present to act as a guide through this process. CDW Engineering has done the next best thing to assigning one of their professional, full-time commercial property inspectors to act as your mentor as you take on the challenge of a commercial property. In?the Instructional DVD,?A Day in the Life of a Commercial Inspector,?CDW fills in the gaps between the classroom and the electrical room. In this video series, join Richard Weldon, P.Eng,. as he demonstrates first-hand the commercial property inspection process. Our cameras follow Richard and the rest of the CDW team through an actual inspection, from the initial discussion with the client, through the actual inspection process, and finally to preparing the report. In this video you will feel like a member of the CDW team, see first-hand what to expect on the job and learn many inspection tips that take years to learn first hand. – Pertinent questions to ask the client when calculating your fee and sending out a proposal, so you don?t need to visit the property. – The proper way to determine the true size of an electrical service to a building. You would be amazed to learn how many inspectors are doing this incorrectly! -? The proper way to assess the fee for services rendered. Those who charge too little are seriously shortchanging themselves; those who charge too much are destined to be consumed by the competition. This DVD has been prepared specifically for those in the industry. Home inspectors getting into commercial inspections will find this experience invaluable. It?s like field training from the comfort of your home or office. Architects, Engineers and others who already do commercial inspections will be pleasantly surprised by the ?tricks of the trade? revealed here that commercial inspectors tend to keep confidential. 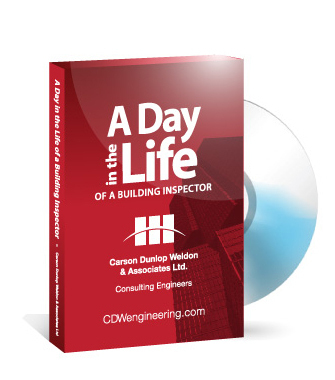 Over one and a half hours in length, ‘A Day in the Life of a Commercial Inspector’?will be especially helpful to commercial appraisers, property managers and realtors who work with commercial properties every day. Think of how much your service to your clients or employers will increase once you familiarise yourself with commercial buildings, common problems found at buildings, and how to best address them. Click here to view samples from the DVD on YouTube.